Many production potters, who spend long hours at the wheel, throw in ergonomic positions which may include standing or sitting upright next to a raised wheel. 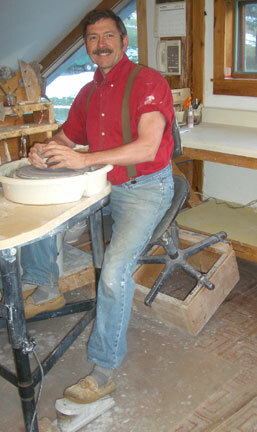 Robert added leg extensions to his potters wheels making them very comfortable to throw on. This particular wheel, a Pacifica, has a strong molded splash pan on which he rests his forearms for leverage. After a back injury, Robert taught himself good posture when at the wheel. He accomplishes this by keeping his back vertically aligned and his pelvis tilted. The unusual wooden platform he built under his chair is the key to a comfortable days work. Even though this office chair has little padding, it is superior to the thickly padded seats that most potters use, since the more traditional seats require the potter to sit flat. This design tilts the potter’s pelvis, making an ergonomic alignment of the potters, back, legs and shoulders. Note that the wheel height is above the potter’s waist. In this position the potter has 30-60% of his weight on the seat. He or she can adjust this position up or down by shifting more or less weight to their legs. Another Side View. The rear is permanently raised 2.5″ Note that the chair is tipped forward raising the wooden form several inches. An office chair with an adjustable height control or air piston, is secured to a wood frame that is 2.5 inches higher in the back. This results in a chair that is always tilting forward to a slight degree. 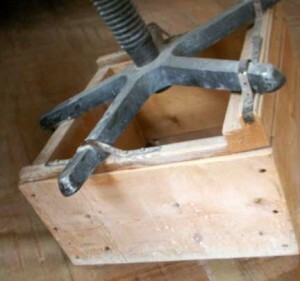 The chair legs are secured to the wooden box with metal straps. When the potter sits on the chair, he can lean forward, tipping the wood box on it’s front edge. This propels the potter forward and over the wheel. The front edge of the wooden frame could even be secured to the floor with a hinge, since the potter does not need to slide the chair forward. This design means a potter can sit on the chair, tip it forward to be over the wheel. When done throwing, he simply tips the chair back. Even with muddy hands, there is no need to touch the chair, and when tipped back on the wooden frame, there is ample room to access and egress the wheel. Front view of the seat. Note the duct tape, which is holding a weight to the bottom of the seat, to prevent it from spinning around when you get off the chair. There was a tendency for the seat to swing forward 180 degrees. To remedy this, Robert added a weight under the front of the seat. This insures the chair remains in its proper position, with the chair’s back in the uphill position. The added weight countered balanced the weight of the chairs upper back support. Chair altered during New Zealand workshop tour. By taping a block of wood under the back legs of the chair, he achieve the needed “tilt” to his chair. While giving workshops in New Zealand, Robert adapted a number of chairs to better positions. Here is an example. 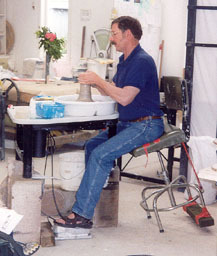 Robert improvised an ergonomic wheel when demonstrating at the New Zealand Potters Conference in 2002. 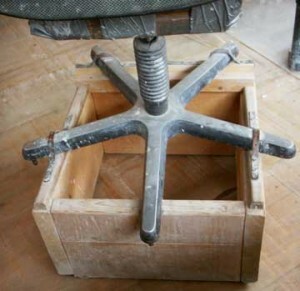 The wheel was raised onto cement blocks and the chair received its tilt by taping a wood block under the back legs. Robert learned to throw with better posture by keeping his pelvis tilted, and raising the height of his wheel, to keep his back vertically aligned. 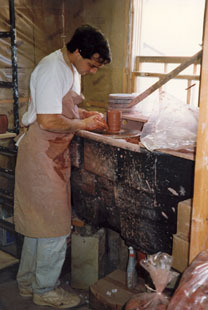 Potter at work in Ben Owen III’s studio. In 1986 Robert and Christine were traveling through North Carolina when this photo was taken of a potter who is standing for comfort. A “Brent wheel” is sitting inside a 150 gallon plastic trough which creates a large splash basin for catching trimmings and slop. 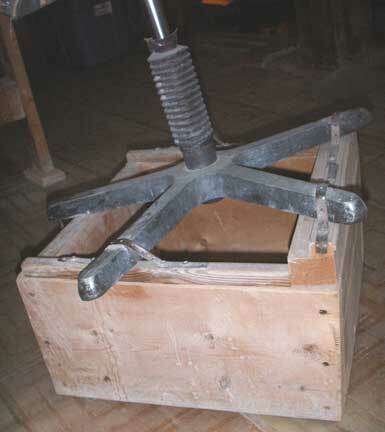 The foot pedal is on the table and controlled by the potters hand. Therefore he does not stand off balance by trying to use a foot pedal on the floor. Robert took this photo in 1971 of a potter working in the clay studio at the University of Vermont. The wheel was attached to the ceiling and used for making tall thin pots. 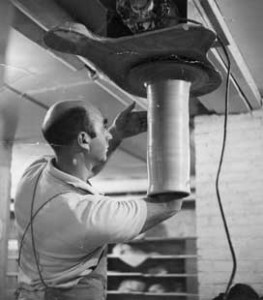 This technique has the potter working with gravity rather than against it. Photo taken in 1971, University of Vermont pottery studio.